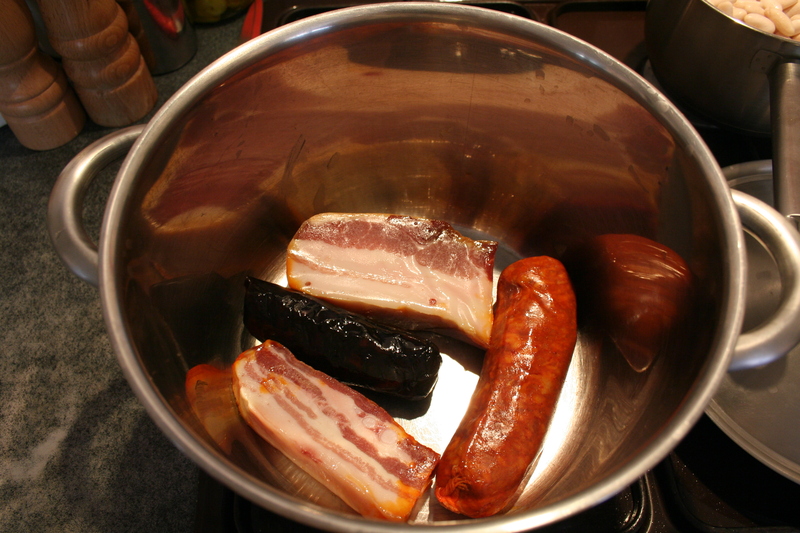 Pezzarella's Kitchen | Adventures in Spanish and Asturian cuisine – fabada or worse! 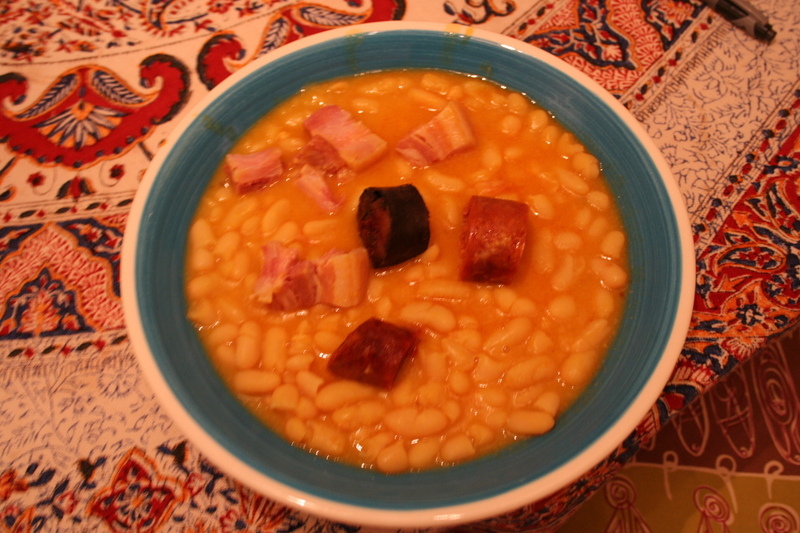 Adventures in Spanish and Asturian cuisine – fabada or worse! 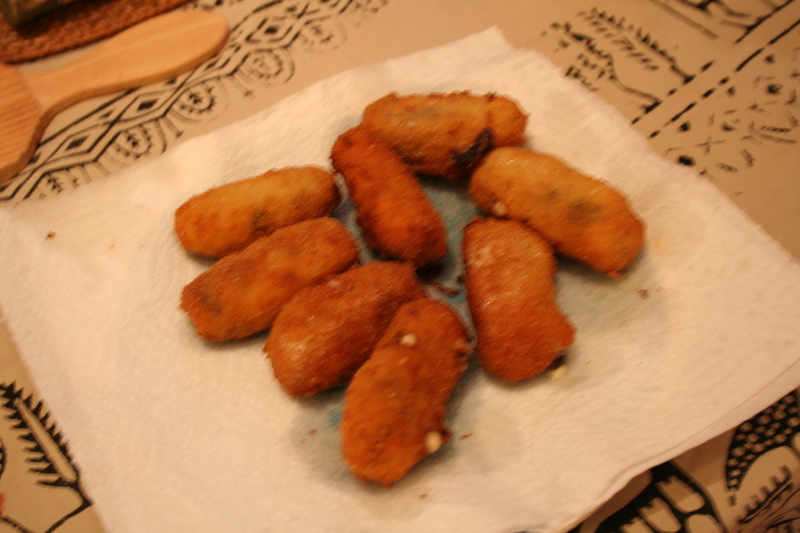 The filling for these croquettes is a thick bechamel sauce, to which we will add the morcilla later. 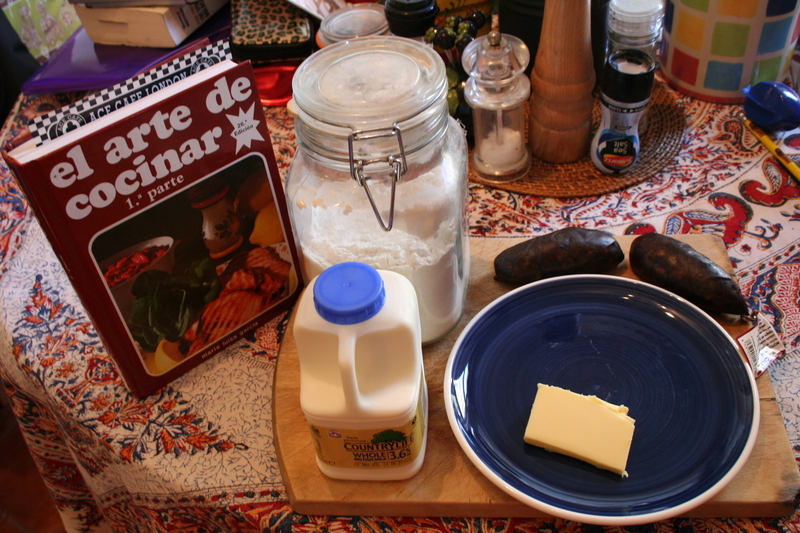 For this I usually follow Maria Luisa Garcia’s recipe, to be found in her excellent book El Arte de Cocinar, very popular with Asturians and still sold today. 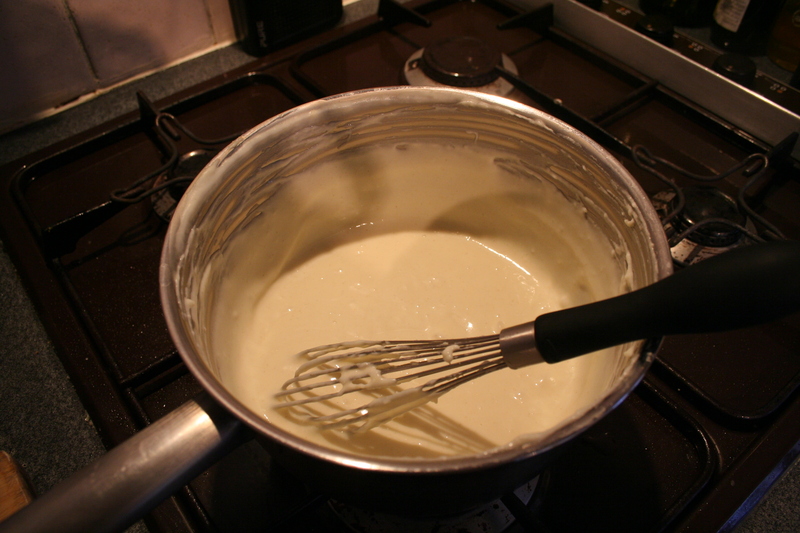 The milk has to be warm when it’s added, so it’s a good idea to heat it in a pan on a low fire while you tinker with the other bechamel ingredients. 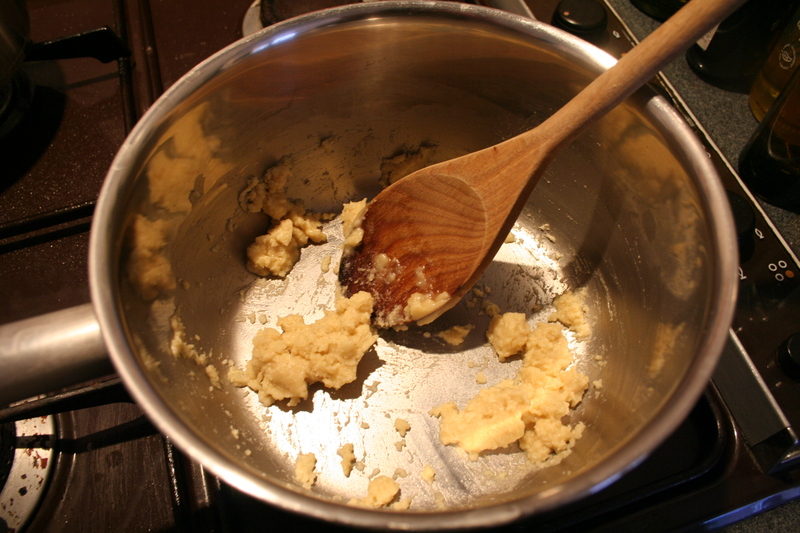 In the meantime, melt the butter in a saucepan, and when it’s melted, add the flour, stirring continuously for about 3-4 minutes, trying not to brown or burn it. 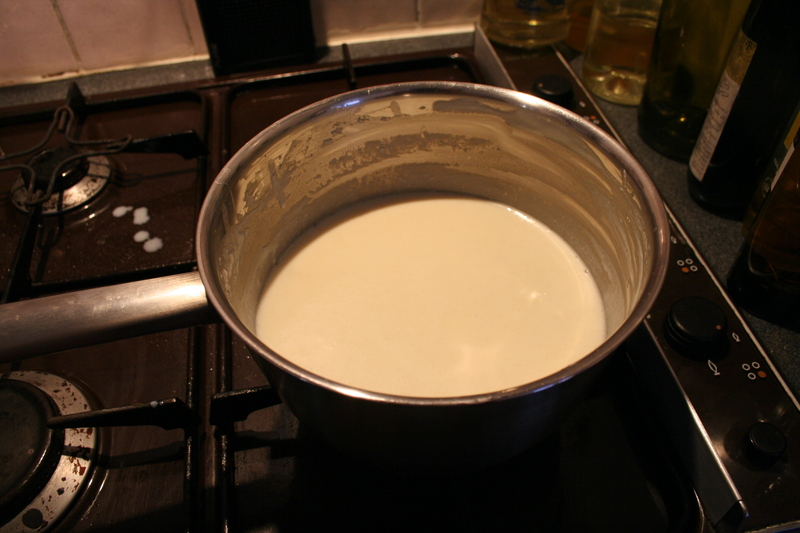 When all the milk has been added, stir well and de-lump, and put back on a medium fire. 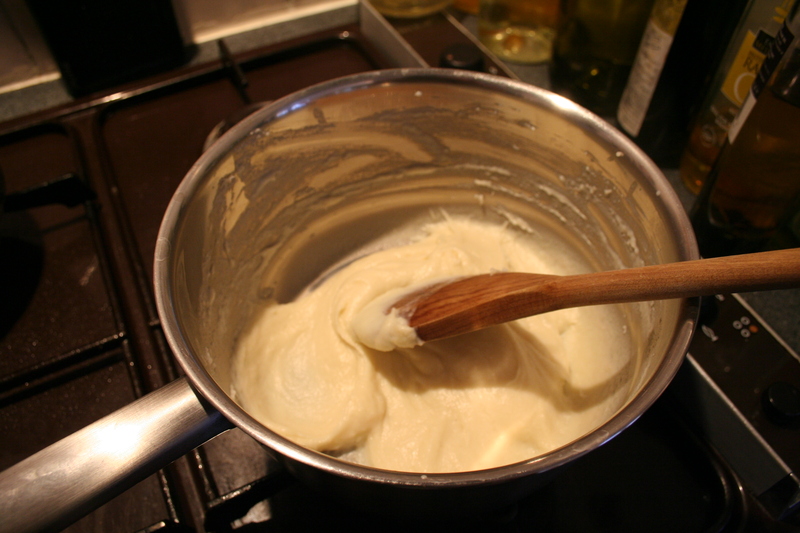 Cook for about 15 minutes or until it reaches a thick and creamy consistency, stirring all the time with a whisk, to get ready of yet more lumps that will keep cropping up. 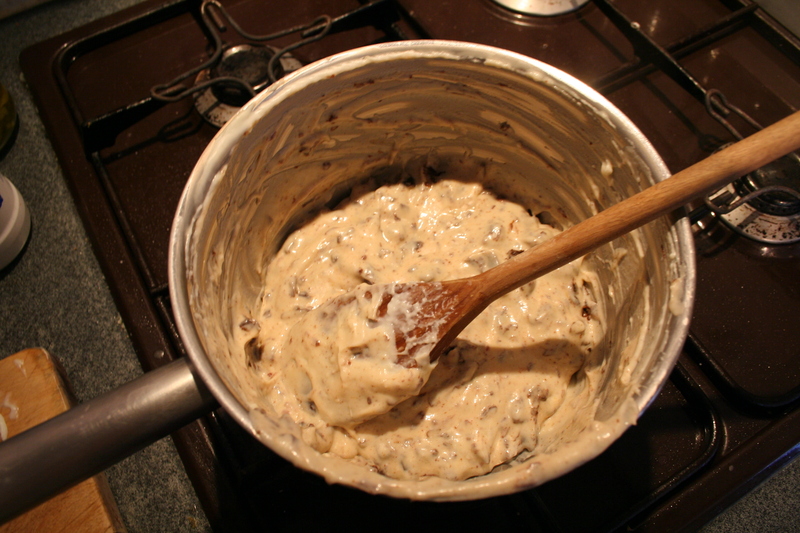 Once the bechamel has reached the desired consistency, remove from fire and stir in the morcilla. 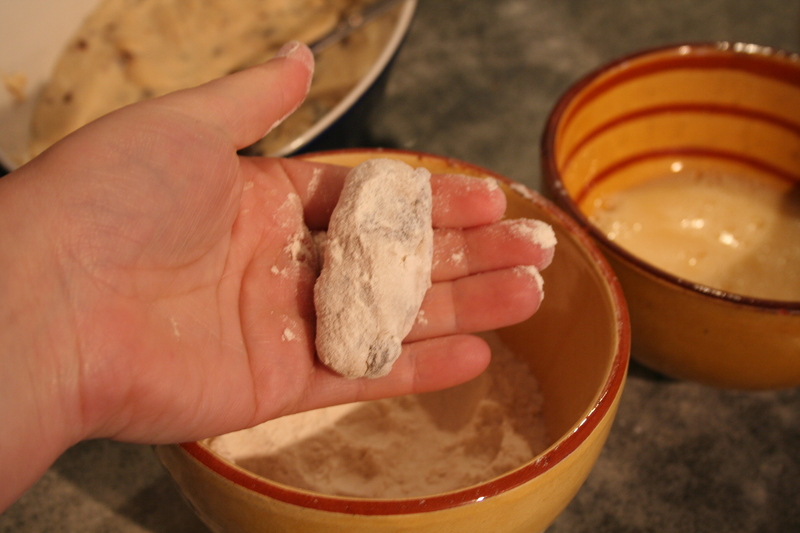 Decant the croquette filling into a shallow oven dish and cool for several hours, ideally overnight at room temperature, or if you’re in a hurry in the fridge until it’s cold and bouncy to the touch. If you have any pets, or humans prone to sticking their paws into food, it might be best to cover the dish with kitchen foil or cling film. I once left mine on the kitchen counter to find a cat’s paw print on it when I went to use it! 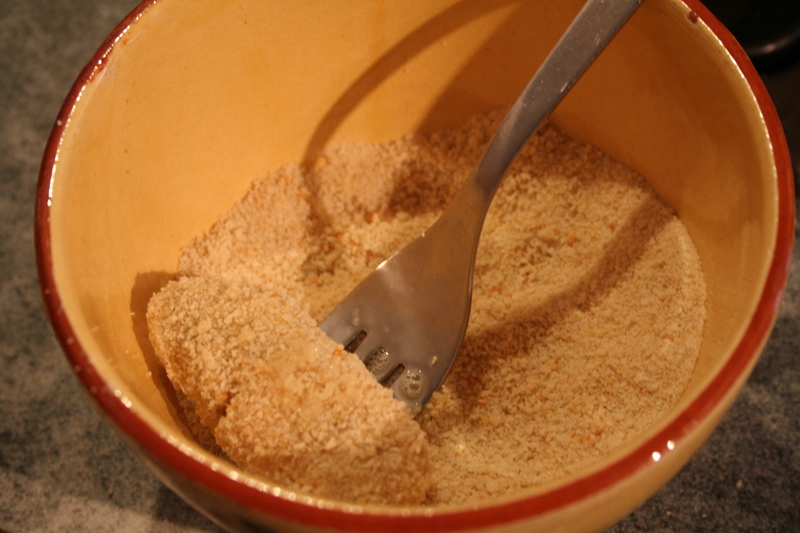 When the filling is ready to use, get your breading ingredients ready: flour, beaten egg and breadcrumbs. 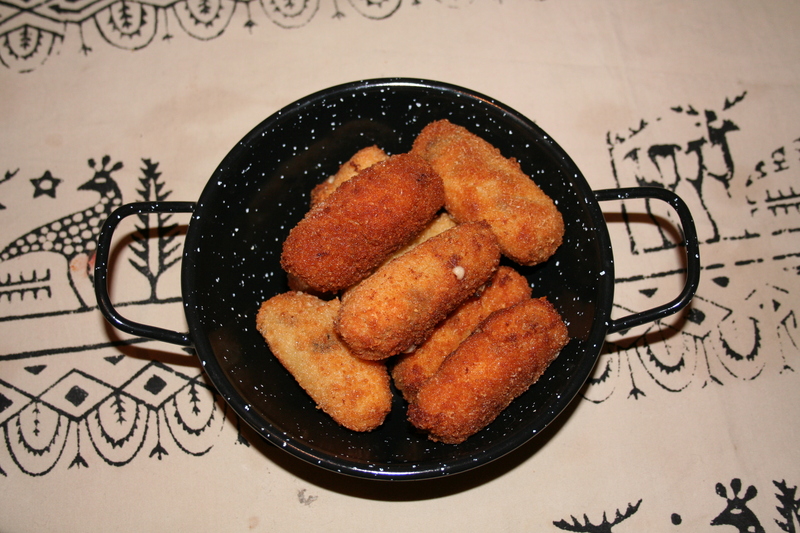 Also, you’ll need a container or a plate to put the rolled croquettes in. Repeat until you’ve run out of paste. 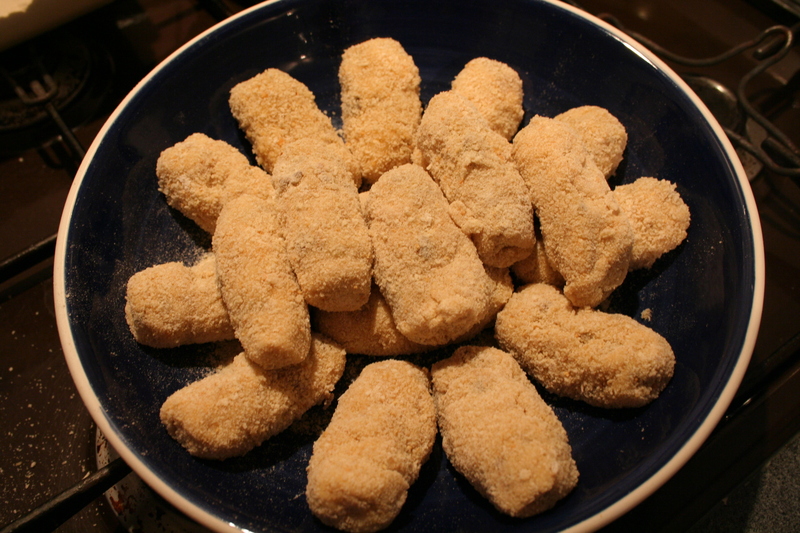 Once you’ve got all the croquettes, if you wish to cook them straight away, get a deep frying pan ready and fry them in abundant oil. Make sure the oil is really hot before putting them in, or they will split (there is a high chance this will happen anyway, so don’t worry if it does; people will eat them anyway, I assure you!). 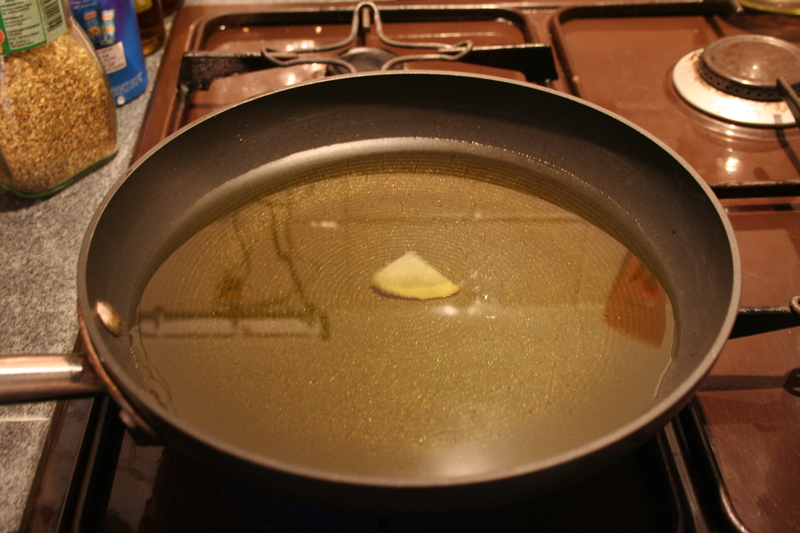 Cook until golden, then take out on to a plate or bowl covered in kitchen paper, to absorb some of the oil. Apologies for the long interval between posts. Life does sometimes get in the way! 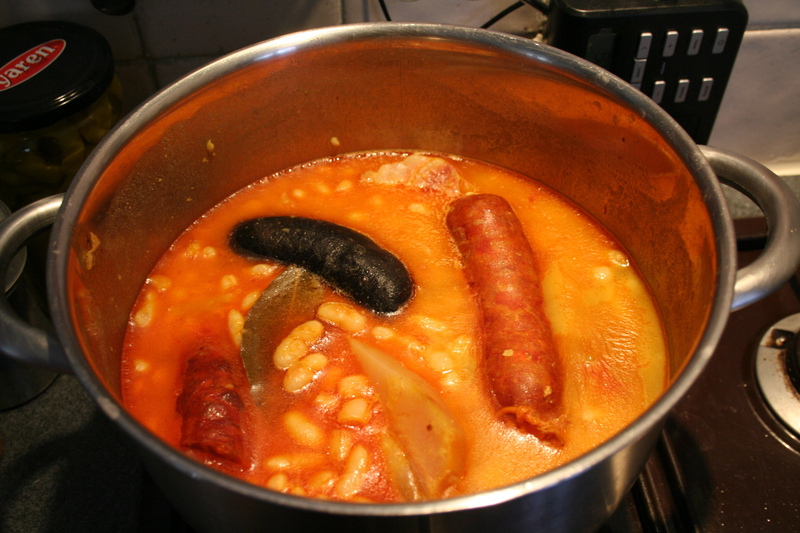 The dish I am presenting today is the Asturian dish par excellence – fabada asturiana (eminently non-veggie-friendly – sorry!). 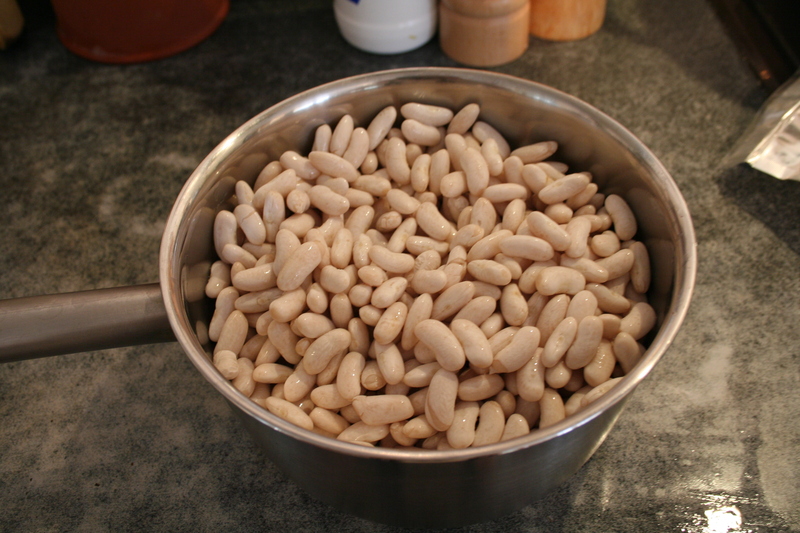 It is, essentially, a very comforting bean-and-sausage stew which is fairly easy to make, although it does take at least a couple of hours to cook, which makes it the ideal dish to cook if you’re pottering around the house doing other things, as it requires minimal supervision. As it often happens with stews, it tends to taste better the day after you’ve cooked it, but you can certainly eat it on the same day. This is how you do it. VERY IMPORTANT: the fabes will need to be soaked prior to cooking, ideally overnight, but if not, 6-8 hours during the day will do. The lacon might need to be soaked too, if it is too salty. 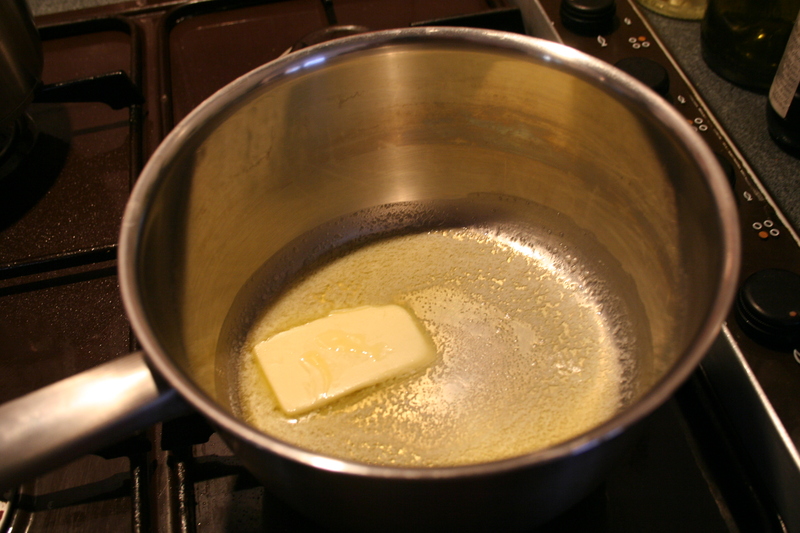 Once all ingredients are ready to cook, place the meat at the bottom of a large saucepan or medium pot; it doesn’t matter if it’s too large, as the fabes will increase in size when cooking. Place the fabes on top of the meat. 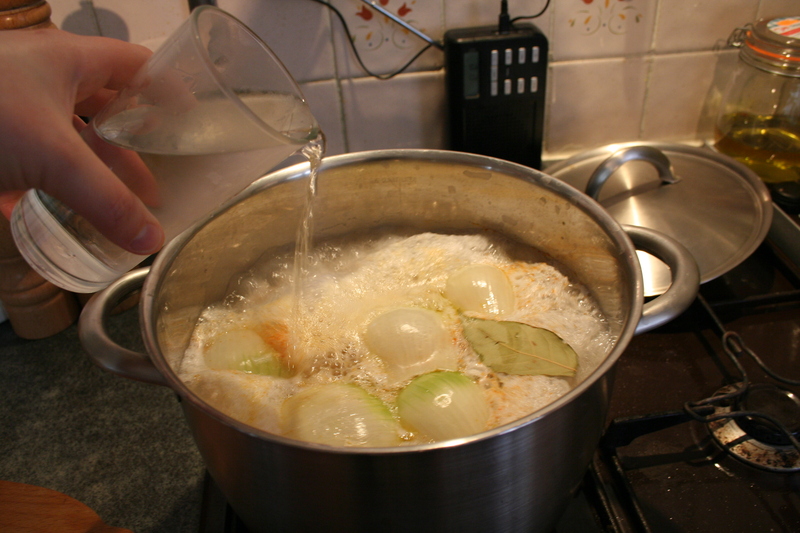 Peel the onion and cut it into two halves; separate all layers and place them over the fabes and the meat. 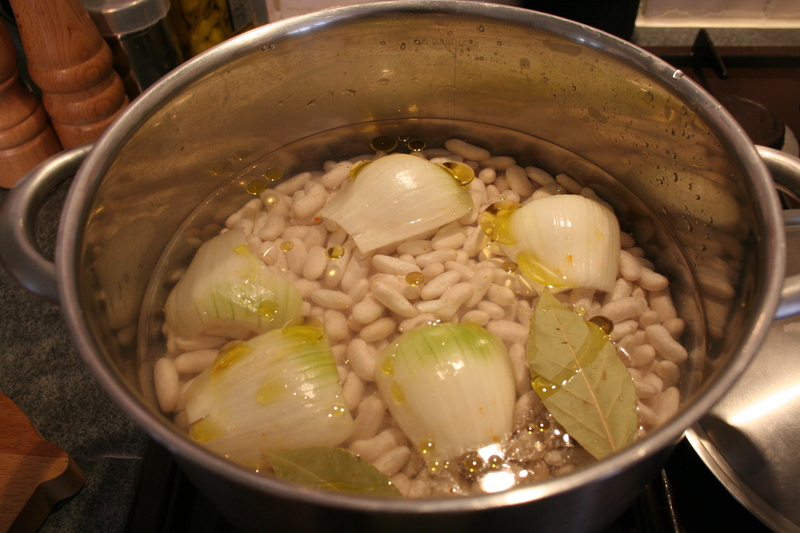 Add the bay leaves and cover with cold water. Bring to the boil. When the water gets to boiling point, you’ll need to “frighten” the fabes (I swear this is the proper term!) 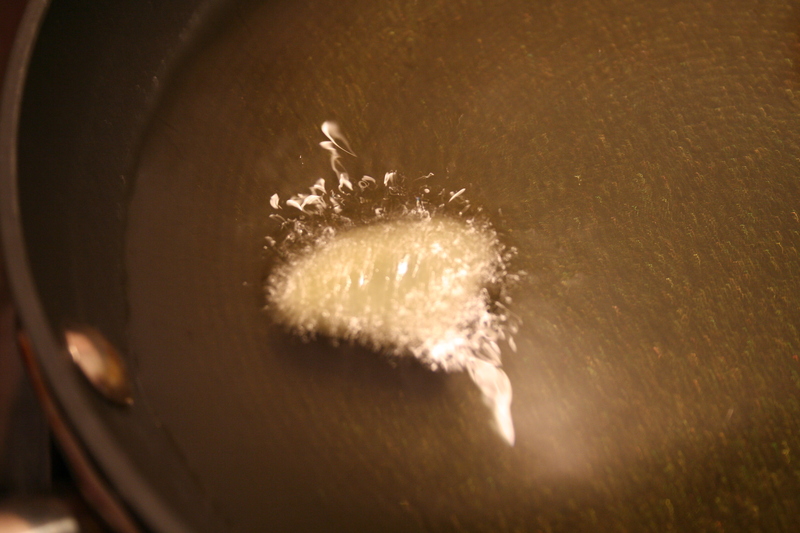 by pouring a bit of cold water into the pot. Turn the fire right down at this point, and cover the pot with the lid almost completely. If you are using saffron that hasn’t been dried (like the one in the photo), a way of drying it out is wrapping in a piece of white paper if it isn’t already wrapped, and placing it on top of the lid while the fabes cook, taking care to keep it dry. 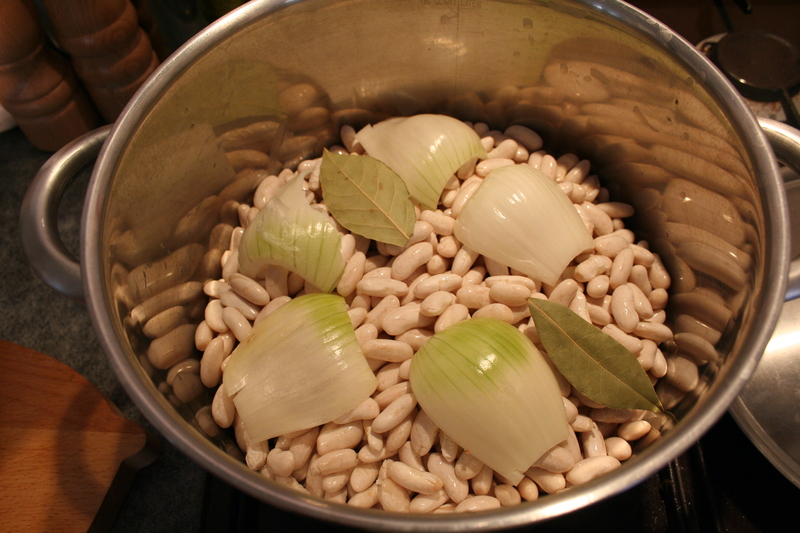 You can now leave the fabada to cook all by itself, keeping an eye on it to make sure the fabes never run out of water: they must always be just about covered in water. As and when the water runs low, “frighten” it again with a small glass of cold water – I normally check mine ever 20 minutes or so. 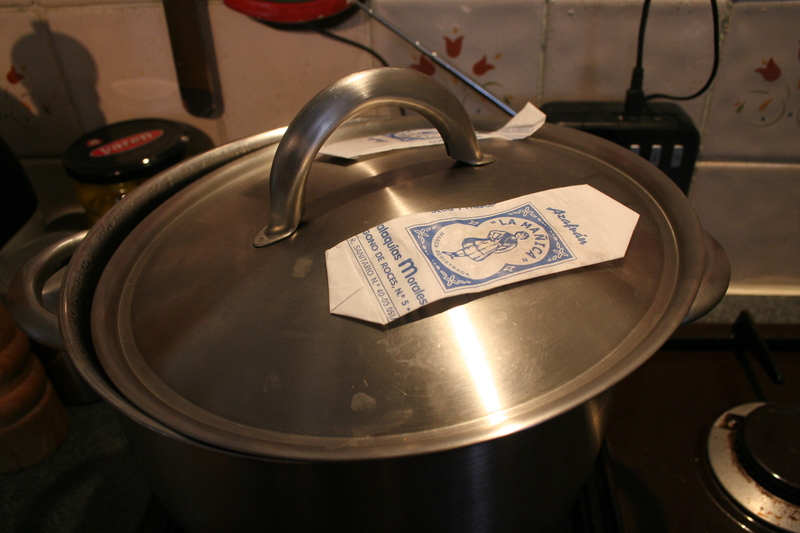 If you want to rearrange the fabes in the pot for a more even cooking and to avoid sticking to the bottom, you can do this by shaking the pot. 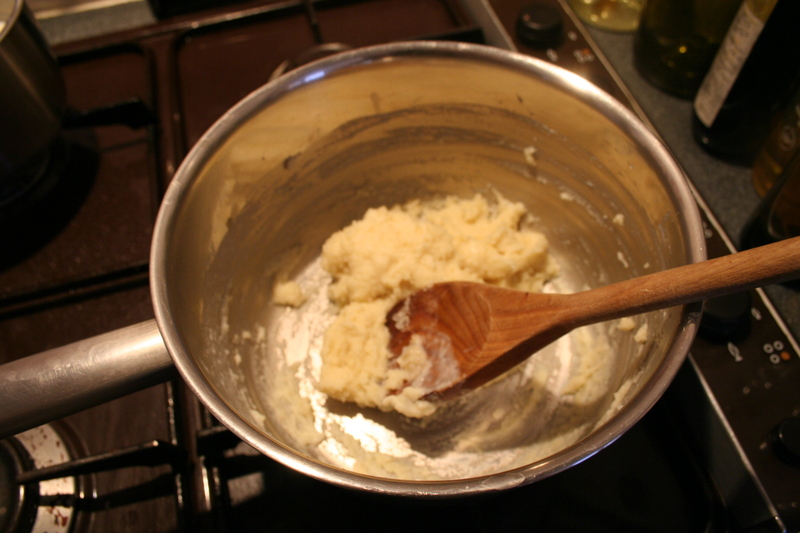 You must NOT use a kitchen utensil to do this, as this will most likely break them up. 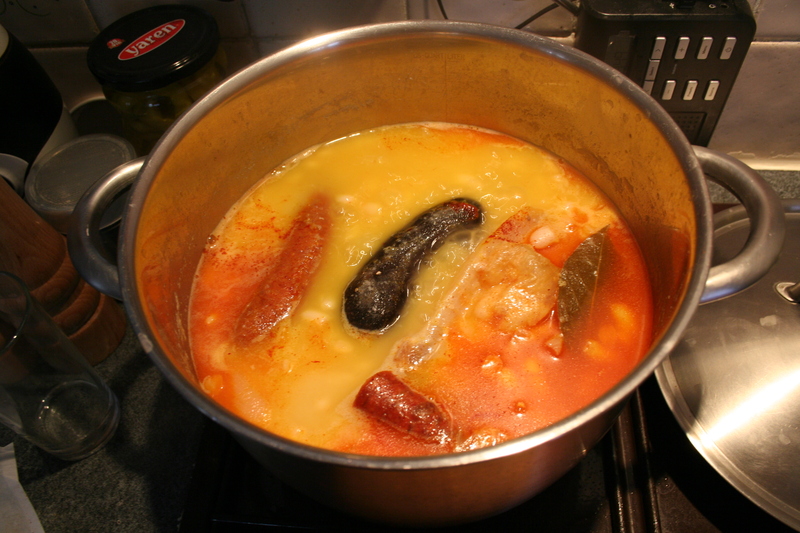 Fabada takes at least 2-3 hours to cook as it’s on such a low fire; when the fabes get to the point when they’re almost cooked but still a bit tough, take the saffron off the pot lid and grind it by using a rolling pin over it while it’s still wrapped in the paper. Add the ground saffron to the stew and stir. 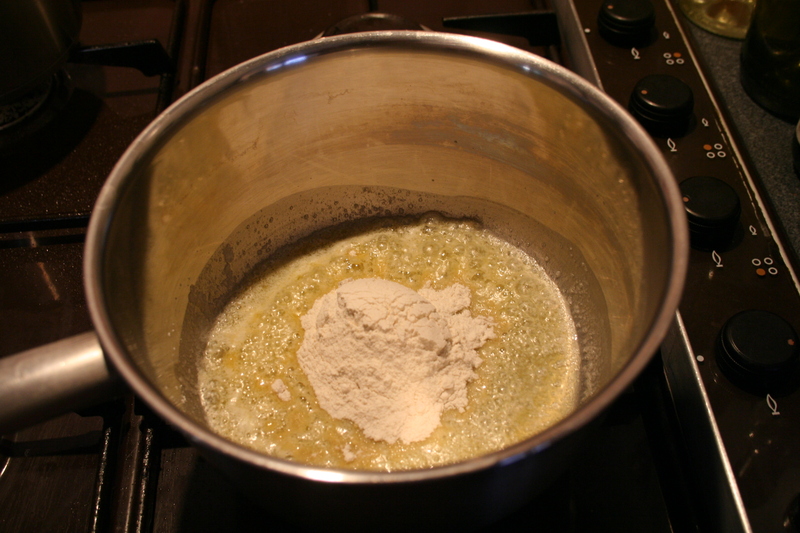 When the fabes are thoroughly cooked, remove the pot from the fire and leave to stand for a bit. Add salt at this point if necessary, although the meat is already salty, so you may not need to. As I said, you can even serve it the day after. 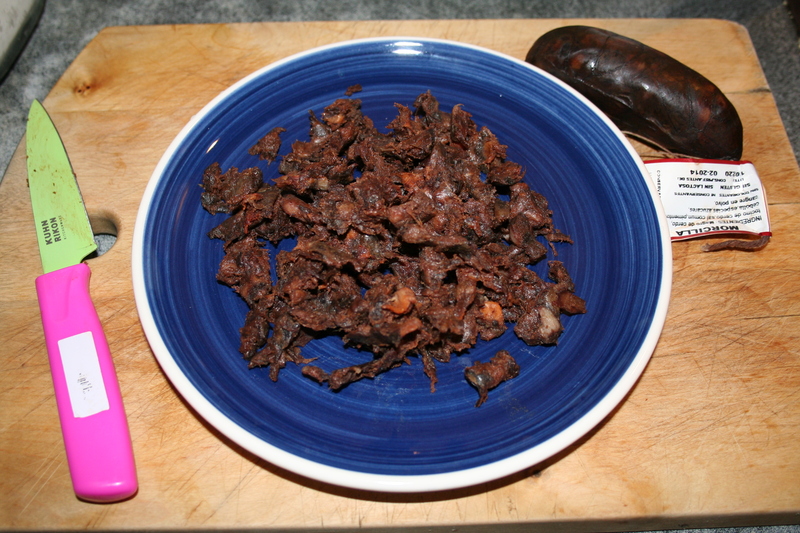 When it’s ready to serve, take the “compangu” (the meat) out, and cut into pieces. 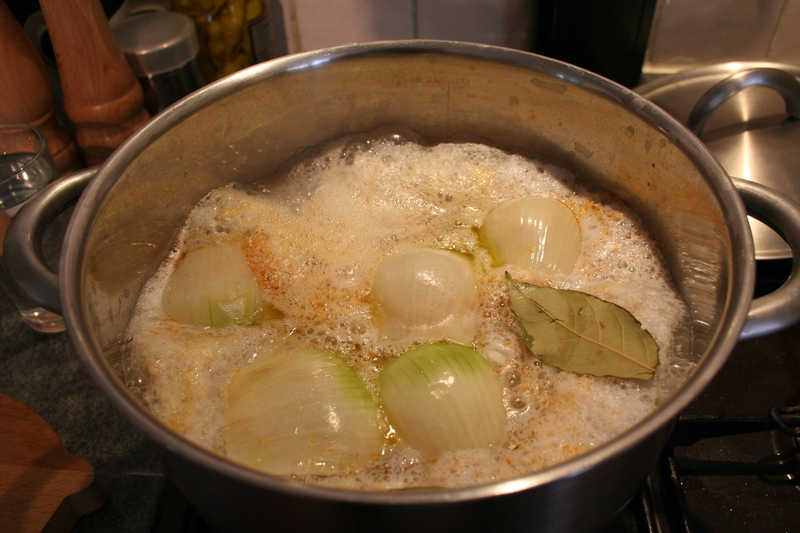 Remove the bay leaves from the stew. Now then! 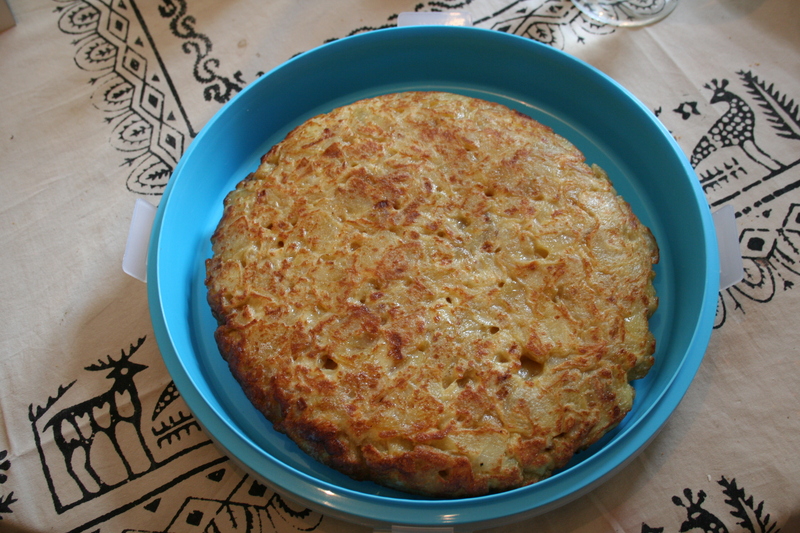 Is there a better way to start a Spanish cooking blog than with the absolute favourite of Spanish dishes: the humble tortilla? 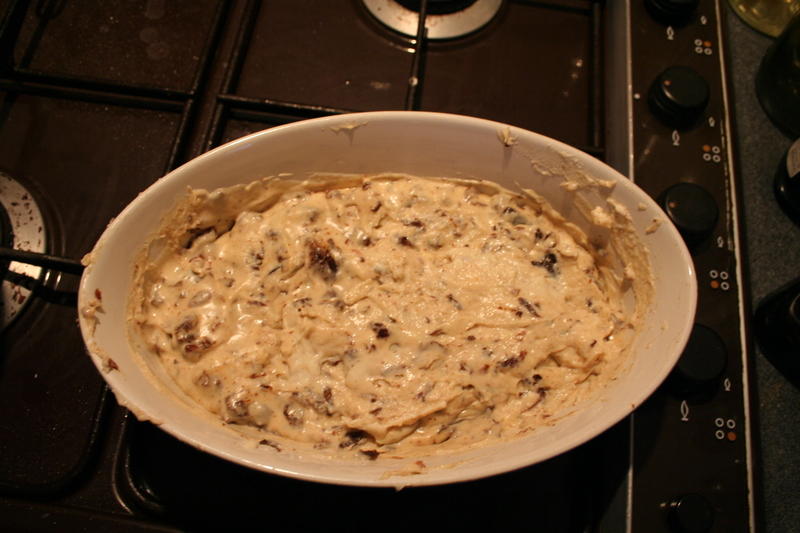 It certainly is the favourite of my friends (or, rather, those who have had the chance to try it), for it is by far the number one of my sPezialities. 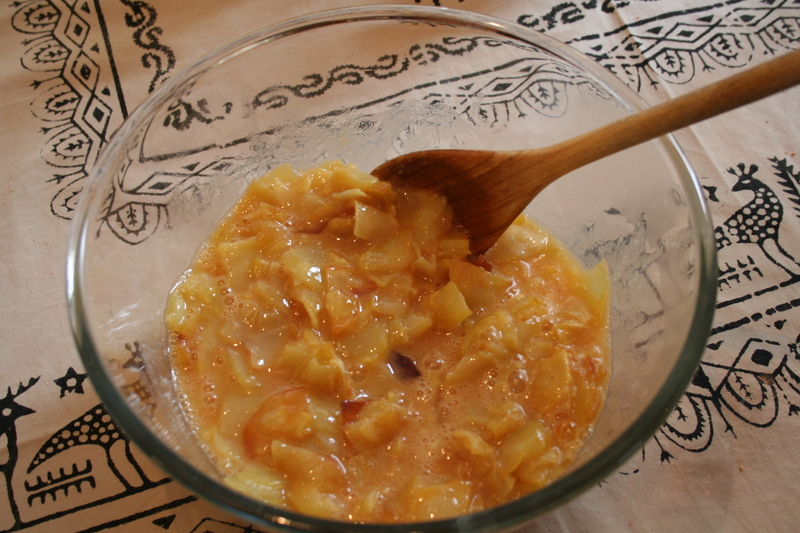 Do not be deceived by the simplicity of its ingredients: you may only need potatoes, eggs, oil, onions and salt to make it, but it is in the combination of those ingredients and the techniques involved that the secret to omelette perfection lies. How many people will this particular tortilla feed? That is, I fear, an unknown quantity: it depends on whether you’re having it as a single dish (2-3 people) or accompanied by what we call “salad-y bits” (3-4 people, or 5 or more but don’t expect any leftovers), or how big your appetite is: one could happily eat a whole one, but I suspect not without feeling quite ill afterwards. Each to their own. 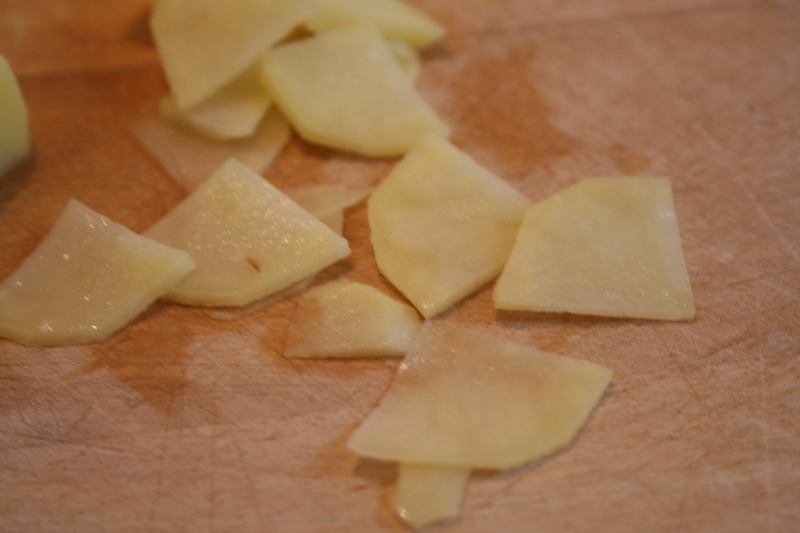 Cut potatoes into thin slices: they way I do it is, I half them lengthways, then make another lengthways cut into each half leaving an inch or so at the bottom so they’re easier to handle. 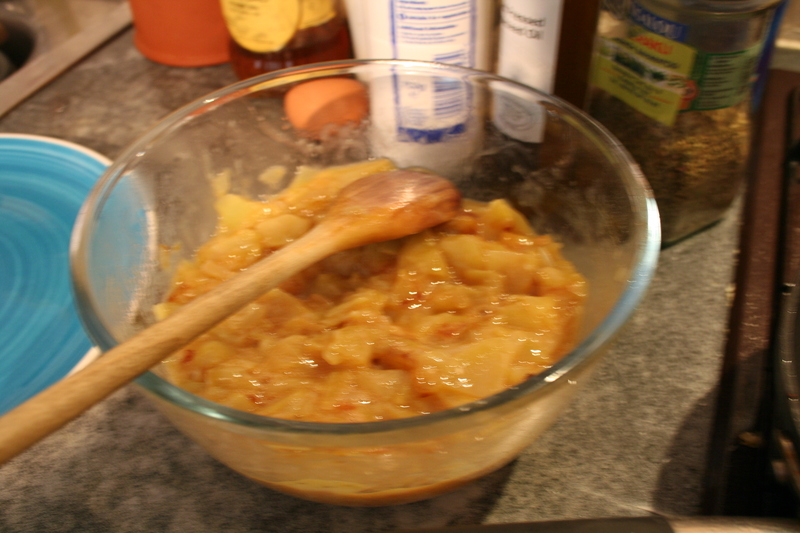 Place one half flat side down on the chopping board and slice thinly. 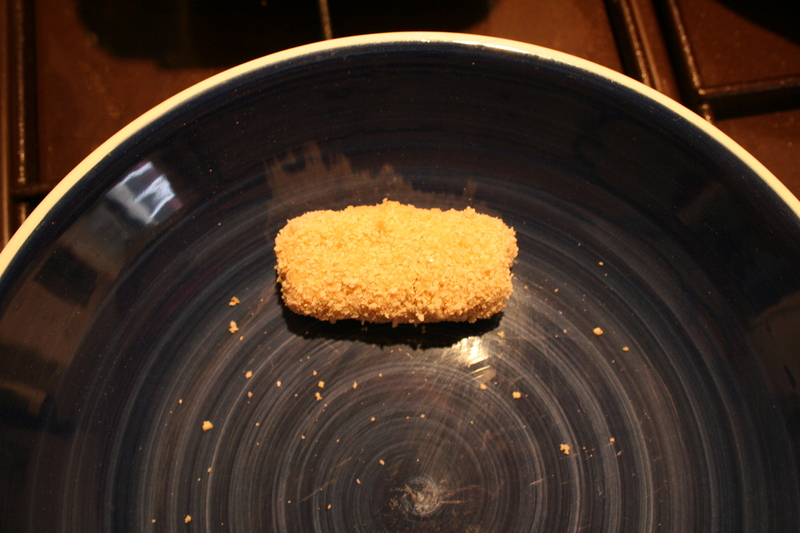 The slices don’t have to be very small, as long as they are thin; this way they’ll cook more quickly. 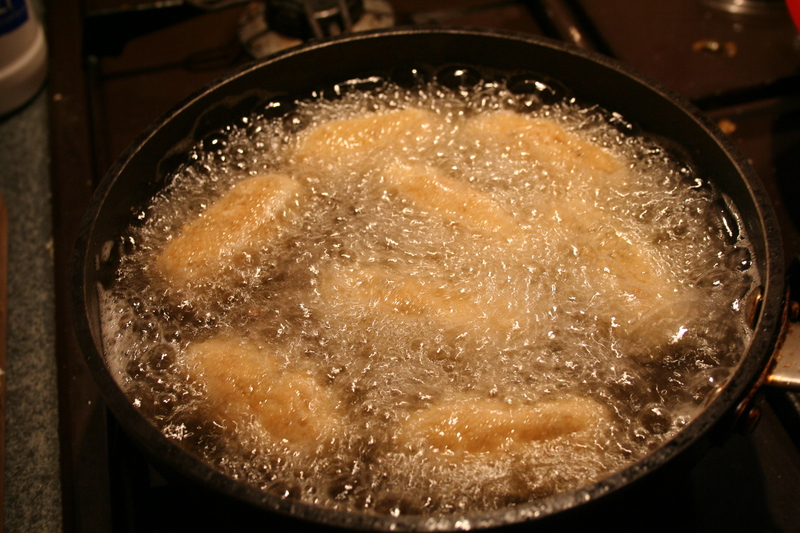 Place abundant oil in the frying pan: the potatoes have to be deep-fried, so you may have to do them in several batches. 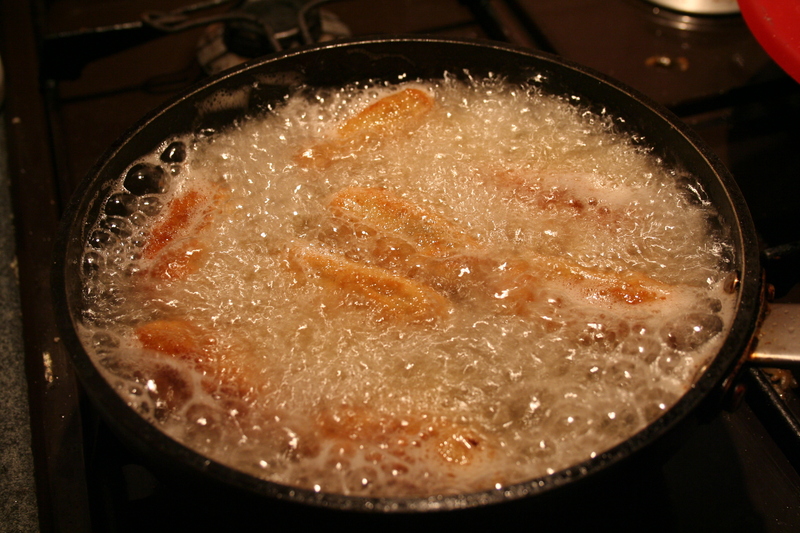 The oil must be very hot when you put the potatoes in; while it heats up, salt the potatoes to your taste. One way of checking when the oil is ready is to put a piece of potato in the frying pan. 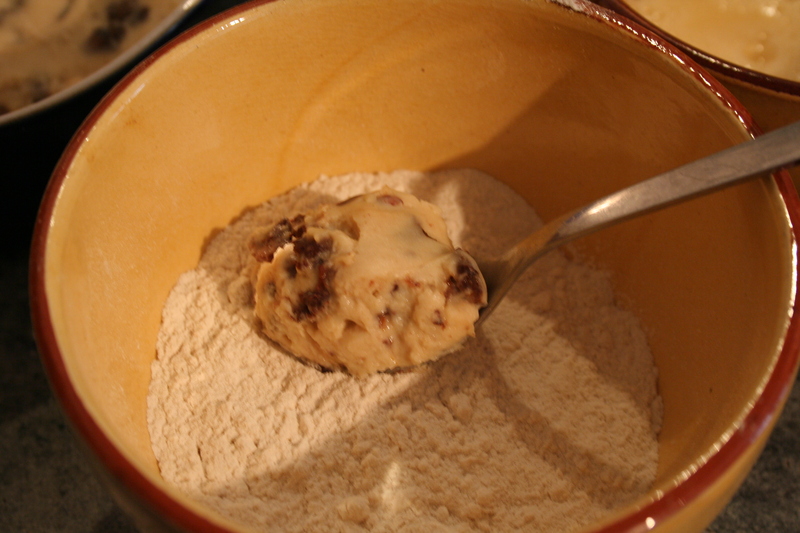 When it starts bubbling and moving about, then it’s ready! 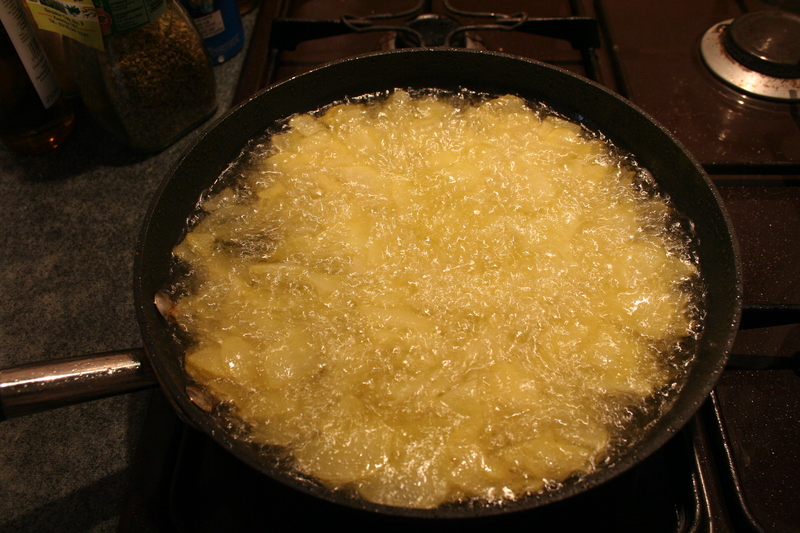 Place the potatoes (or first batch of them) in the hot oil with the aid of the draining spoon/skimmer. They’ll need space to breathe, so don’t put too many in! 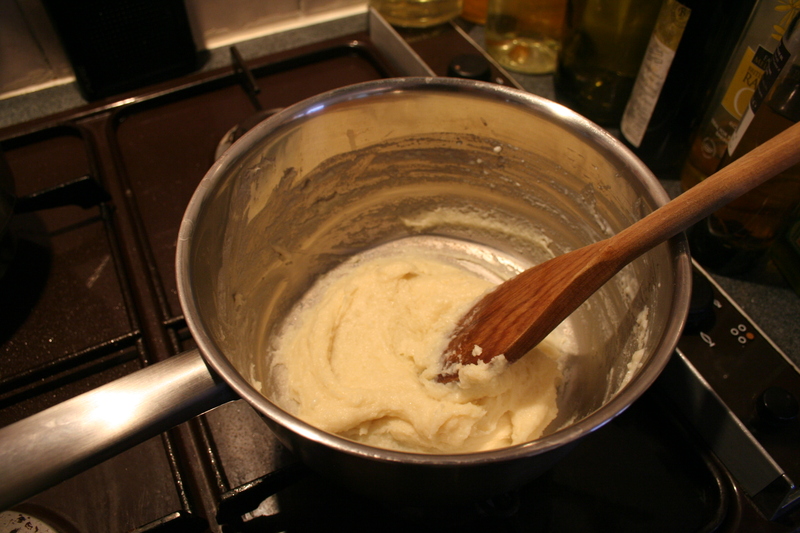 The oil must be hot, but not so hot that the potatoes get burnt or even browned, so you may need to turn it down a bit. A moderate simmer tends to be good. 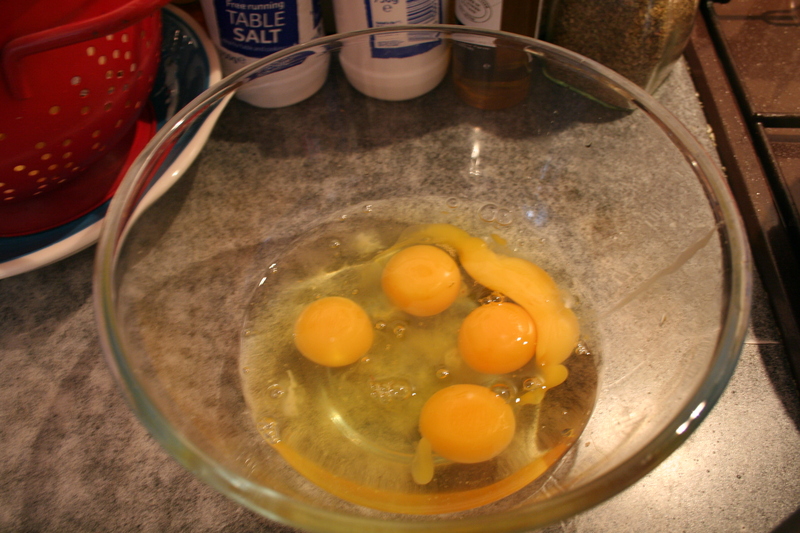 In the meantime, beat the eggs in bowl numero dos. When the potatoes are done (cooked through but not brown or burnt) take them out of the pan with the draining spoon and stir into the bowl with the eggs. If you have a second bath of potatoes to fry, do so now. 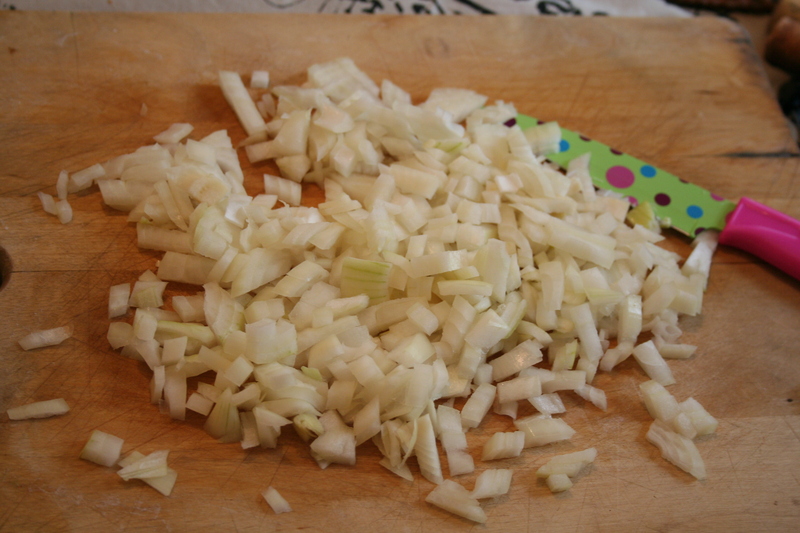 If not, or while they are cooking, chop the onion into smallish pieces. 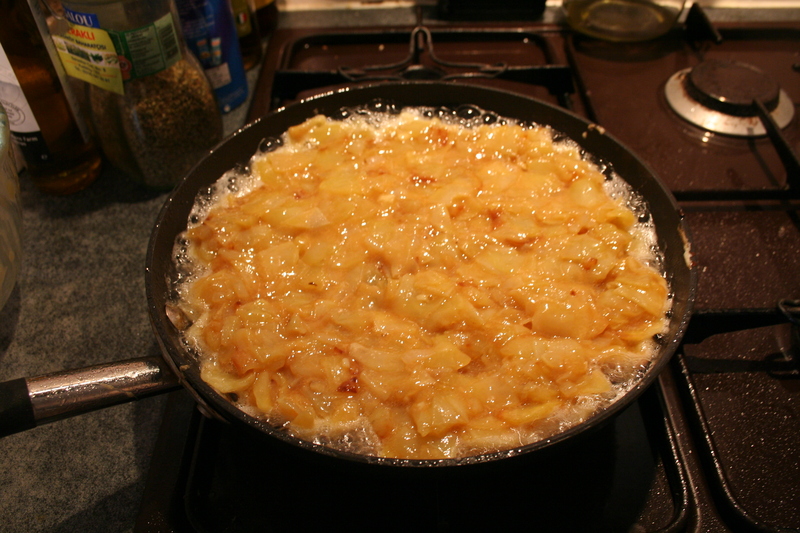 Then, you can either fry it in a little bit of oil until it’s soft, or you can add it to the last batch of potatoes you’re cooking. any tips to avoid crying while chopping onion much appreciated! 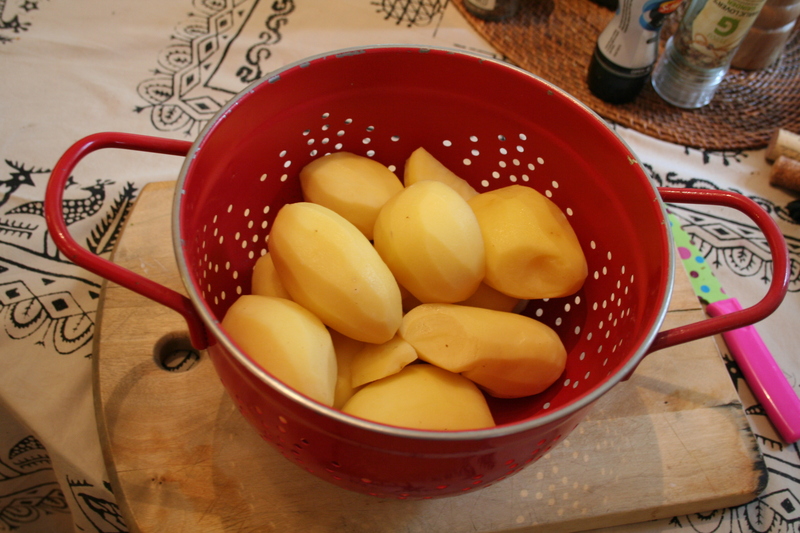 Once all the potatoes and onion are cooked, place everything in the bowl with the eggs and mix thoroughly to form a heterogeneous mix. 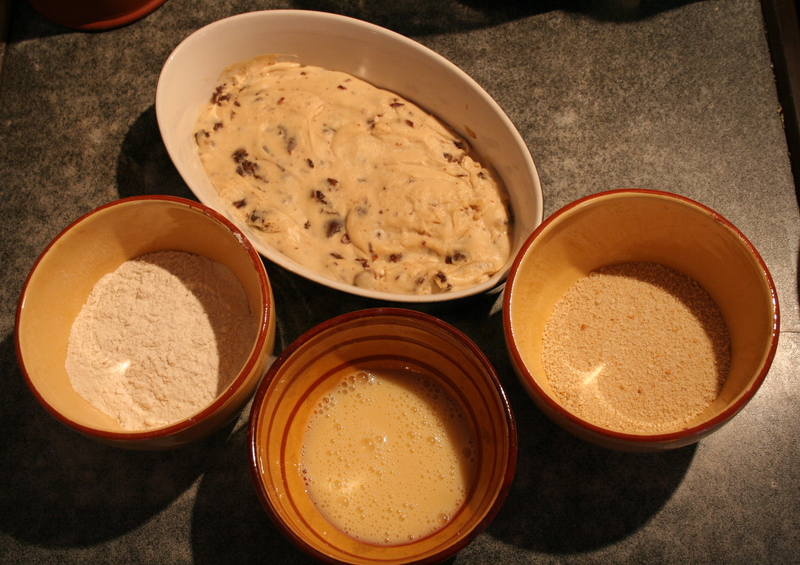 You can then decide whether the mixture needs any more eggs or not – as long as it’s soft and there’s enough egg to bind it together, the rest is up to you. 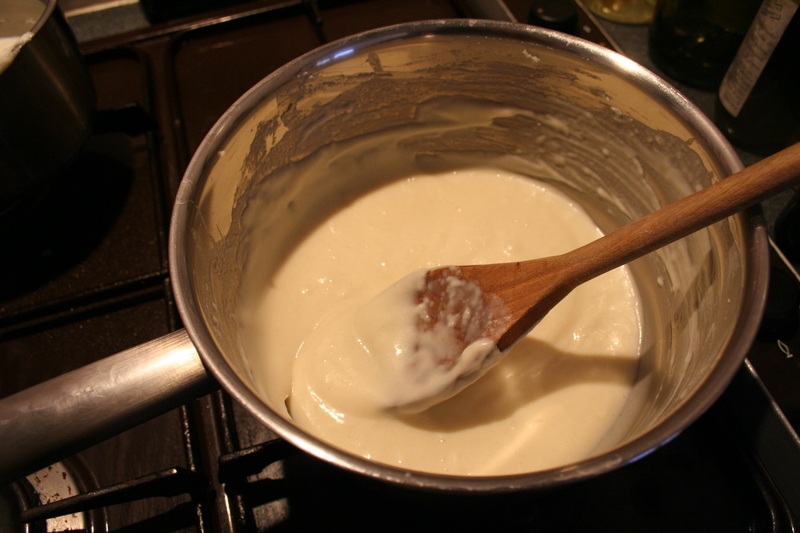 Once you’re happy with the texture of your omelette mix, pour away most of the oil in the frying pan, leaving just a bit to cover the bottom and prevent the omelette from sticking. Once it’s *really* hot (which can be checked by pouring a tiny bit of the mixture into the pan and wait until it sizzles), pour the whole tortilla mix into the frying pan, distributing it with a wooden spoon to make sure it’s even. One way to find out whether this first side is cooked is by grabbing the handle of the pan and trying to make the tortilla slide around inside the pan; if it slides easily that means it is cooked. 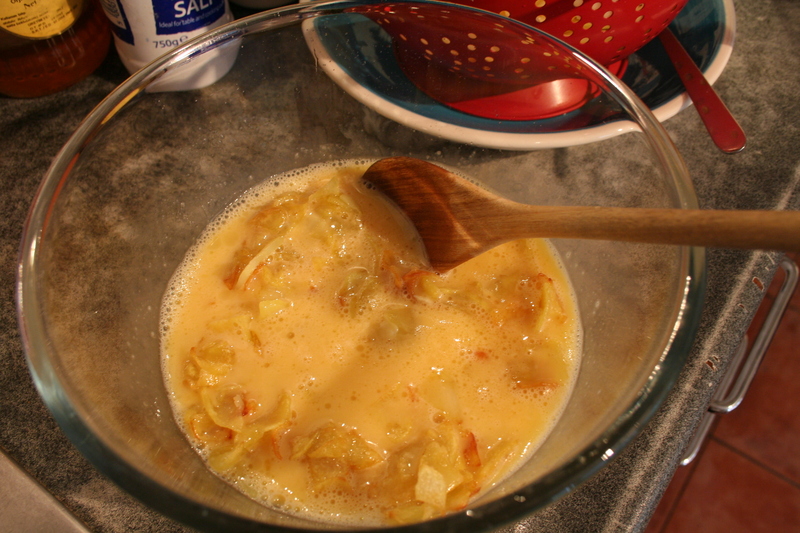 Then comes the most daunting part of the tortilla-making process: the turning of the omelette! It really isn’t difficult: all it needs is determination and a fairly strong wrist. For turning the omelette, place the plate face-down over the pan, lift the pan by the handle and, holding the plate tightly against the pan, turn it upside down quickly, being extra careful not to let the plate slide out of place. 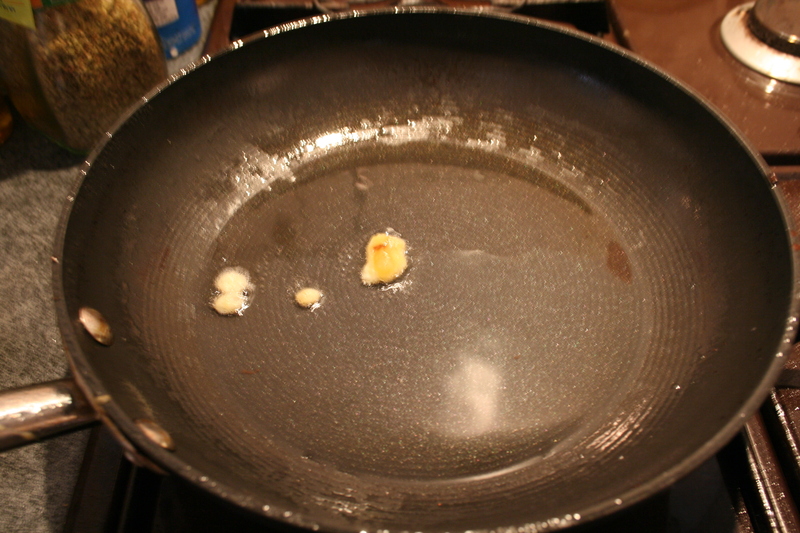 Lift the pan, keeping the plate straight, and slide the omelette back into the pan to cook the other side. It’s a good idea to do this over the bowl, to capture any spillage that may occur! Once the other side is done (repeat the sliding around operation same as with the other side), you can check for consistency by pricking the tortilla with a fork. There isn’t a “correct” texture: as long as it’s cooked inside, it’s up to the cook’s taste how runny or well-done it can be served. I would recommend turning the omelette several times as opposed to just once or twice, as this helps cook the omelette inside without browning it on the outside. 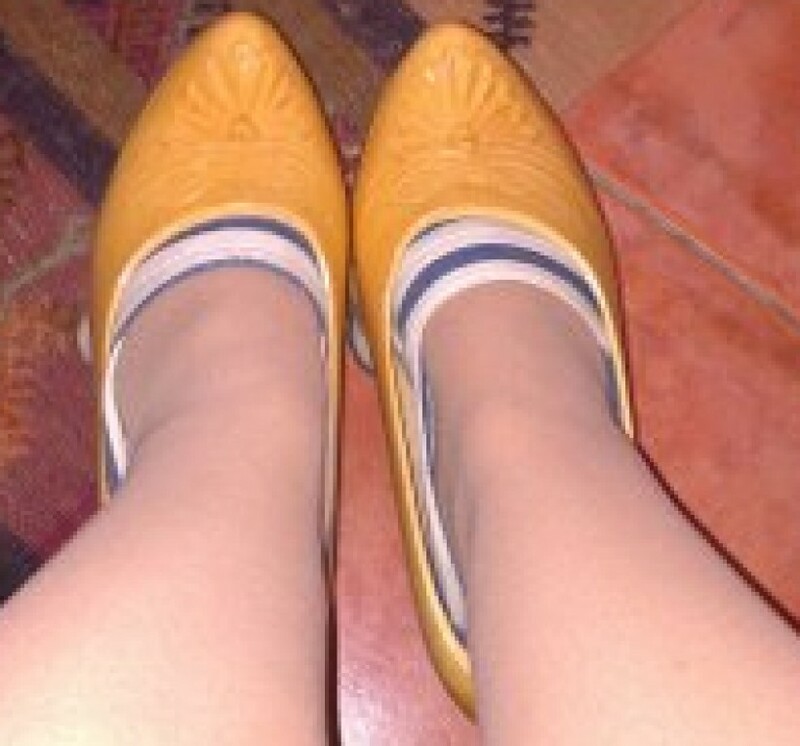 A golden hue is ideally what we’re looking for. Once the tortilla is cooked to your taste, simply turn it back on to a plate and serve. You may want to wait until it’s cooled a bit! One of the many good things about tortilla is you can eat it hot or cold, by yourself or sharing with friends, at any time of day or night. Especially delicious when coming back from a night out, and perfect picnic food. All in all, one of my favourite dishes ever. 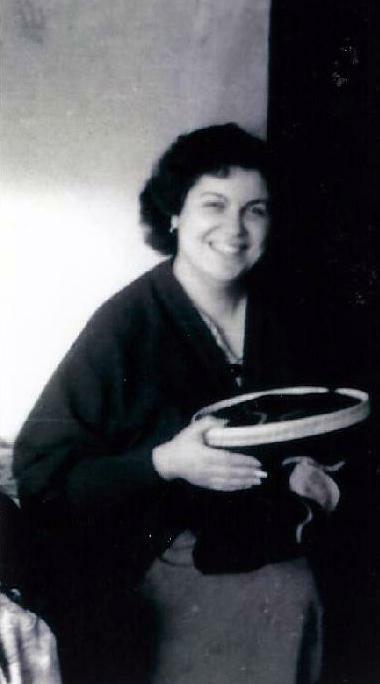 I hope you enjoy your tortillas. Please feel free to add any comments, questions or feedback! Why hello there; nice of you to drop in. Cup of coffee? Thank you for popping by – please do make yourself comfortable. So, what is this all about, then? 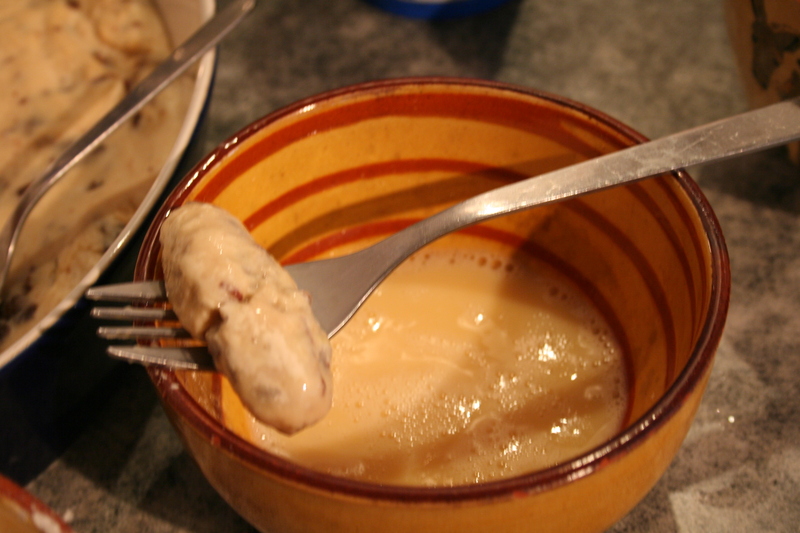 Well; as a Spaniard living in London for a few years now, and much as I enjoy the huge gastronomic variety that can be found in this beautiful city, I sometimes find myself hankering for traditional dishes as cooked by generations of Spanish and Asturian mums and grandmas. 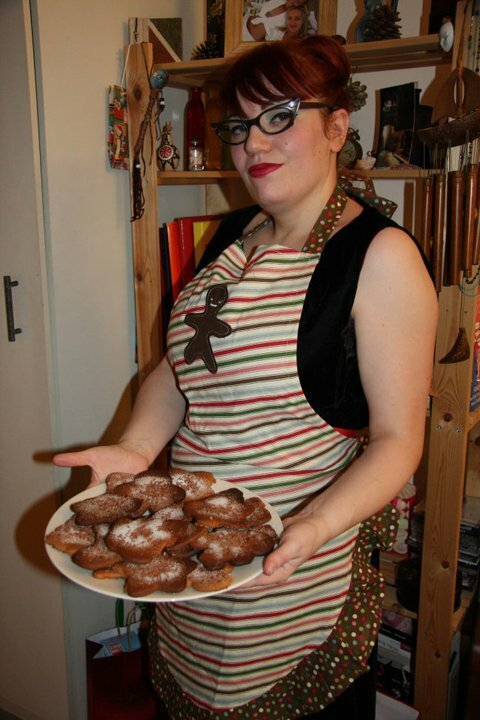 With this blog I aim to bring a little bit of my home to you, readers. 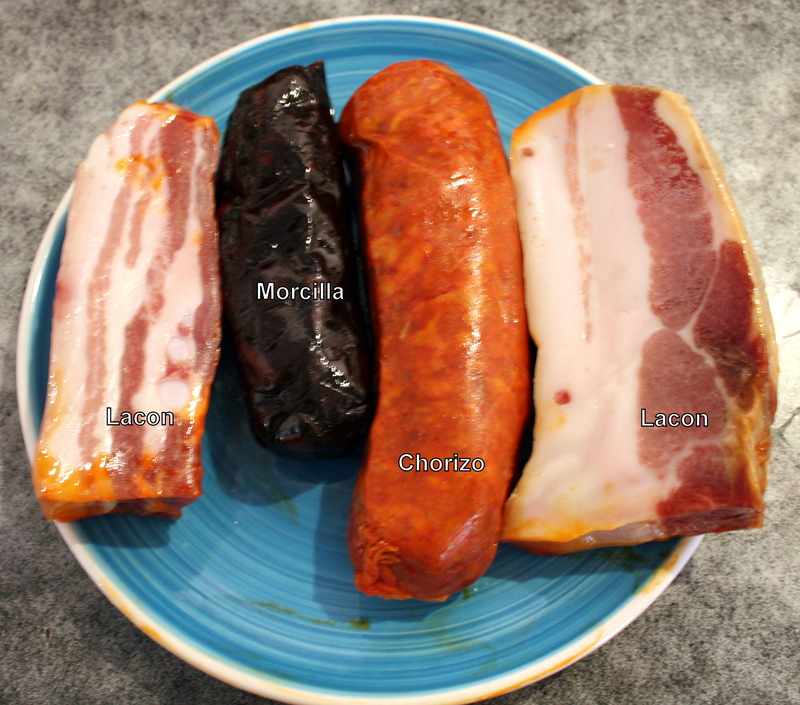 I will therefore be posting traditional recipes (ReciPez) in as much detail as possible and with photos in glorious technicolour for your reading and cooking pleasure. Some of these ReciPez will be sPezialities – i.e. 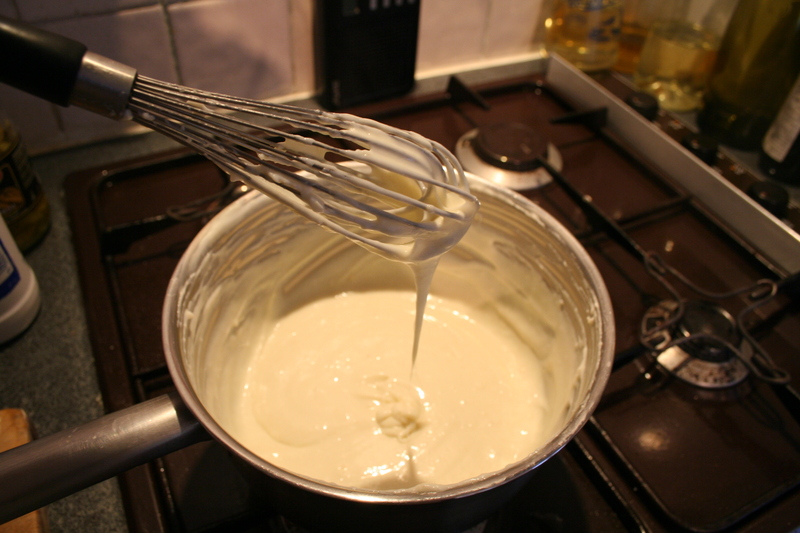 tried and tested methods that I’m used to cooking over and over again, and some of them will be exPeziments – i.e. dishes I’ve never cooked before but which I will be sharing with you step by step and we can, together, discover the results. 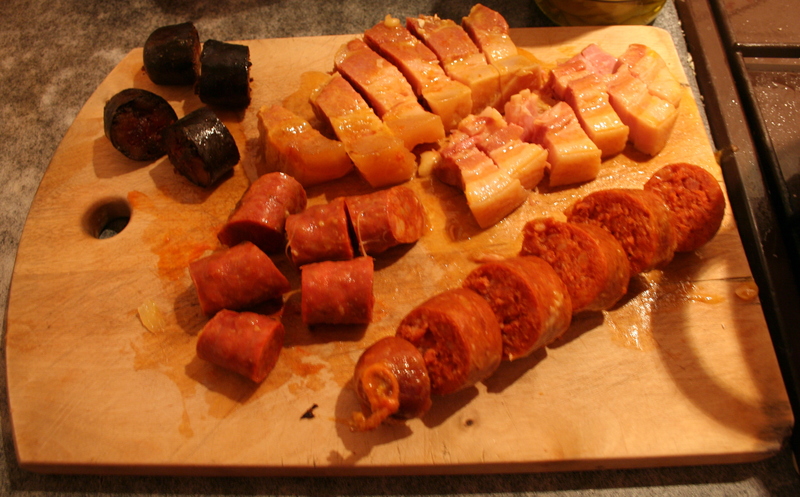 One cautionary word: my ReciPez will describe for the most part the way I cook these meals, methods inherited from my mum and my nanas Conchi and Irene. Never will I claim that these are the only or the best recipes for a specific dish, and so if anyone has any comments or suggestions, I welcome them – as long as everyone plays nicely. After all, we are here with the purpose of sharing and enjoying a damn good meal. No? 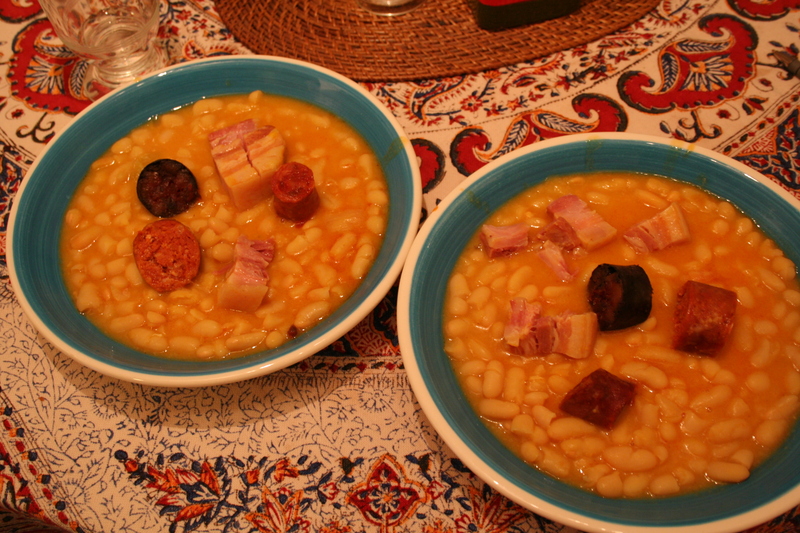 Adventures in Spanish and Asturian cuisine - fabada or worse!